Does Kakugo trigger if it is trashed during an encounter? No. The encounter ends immediately when Kakugo is trashed, but then it is no longer active and thus its ability cannot trigger. This is a pretty strong card. The cost to rez vs cost to break is rather weak, 1 with all reasonably efficient breakers. The influence cost is high enough to ensure it sees little play outside of Jinteki. And with subtypes barrier and AP it's prone to breakage not only by fracters but by the popular Deus X as well (though having the runner trash Deus X to get through wouldn't be the worst thing). One good thing is that at the 4 range it's still usable as gear check ice. It's a bit on the expensive side, but you have to work with what you've got and during the runner's first turn you're probably going to have 4 on hand. But all that is immaterial. The big thing about this ice is that it's a very reliable way to make running painful. For 4 you can make the runner fear for his or her game plan. Having hand cards sniped away can derail a game plan, taking net damage can trigger a host of other nasty effects too. 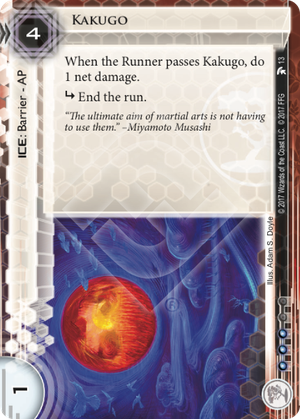 Chronos Protocol: Selective Mind-mapping turns Kakugo into a powerhouse which lets you see the runner's hand once a turn and lets you make targeted strikes to take out the most dangerous cards. Jinteki: Potential Unleashed mills the runner's deck to double the trashing. Synth DNA Modification doubles the net damage for the first run through Kakugo each turn. Tori Hanzō turns that net damage into brain damage. This is an extremely powerful combo as even if the runner trashes Tori the next time you got a clone of her in your hand you can repeat the trick. After the first combo fires an unrezzed card in a server behind Kakugo could well be enough to make the runner think twice about running on that server. Is it possible to get around Kakugo? Certainly. Your best shot would be ICE destruction and at a strength of one it isn't going to take much for Kakugo to get Knifed. Derezzing is another option, but a fairly weak one since at 4 the corp will simply rerez it the next run (and if the corp just can't get 4 I'd say you're winning regardless of whether Kakugo is rezzed). Bypass? I had to look that one up too. But it won't work. According to the FAQ (relevant bits at ANCUR) bypassing ICE still means passing it. The "cannot rez" cards (DDoS, Cyber Threat, EMP Device) won't help much either as they only help for one turn and this is a card who's effect comes from being run through time after time. And if you don't have any tricks up your sleeve? You can always bounce. I'm sure the corp won't mind that.